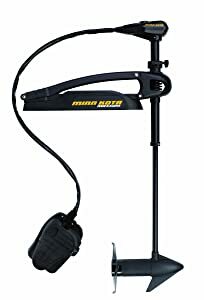 Serious anglers everywhere have found the convenience and usefulness of a bow mount trolling motor. This type of trolling motors provides significantly better control when compared to other types. It’s the best option for those who are looking for a trolling motor that will make their fishing boats as maneuverable as possible. It’s also convenient if you fish primarily in an open bow-rider or on the fore-deck of a bass boat. Therefore, picking the best bow mount trolling motor is key to having a very good day on the water. But what’s the best bow mount trolling motor for my fishing boat? The bow mount trolling motor that best suits your boat comes down to boat size, weight and intended purpose. Selecting the right motor can be challenging as there are so many variables on the market and trolling motor manufacturers generally only provide basic guidelines. A trolling motor might not be a big investment to your boat, but picking the right one at the first will make you feel much more comfortable. If you’re new to trolling motors, this guide is for you. Below are what you should know about choosing a new trolling motor for your boat and our in-depth reviews on some of the best bow mount trolling motors on the market that we think are most likely what you’re looking for. If you’re looking for a bow mount trolling motor that will move your boat quietly and smoothly through the water without disrupting the fish, this Minn Kota Maxxum 70 Bow-Mount Trolling Motor is the best one to buy. This is a freshwater trolling motor which is designed to be used in any rough water or treacherous stump field. It runs cooler and quieter than most others of the same thrust. Made of the indestructible composite shaft, this motor will serve you for life. If you’re considering a new trolling motor for saltwater fishing, we are confident that the Minn Kota Riptide Ulterra Trolling Motors are some of the best saltwater bow-mount trolling motors that you can find. They are pre-installed with i-Pilot, which lets you lock onto a fishing spot, record and retrace paths and command speed and steering with ease. What’s a Bow Mount Trolling Motor? A bow mount trolling motor is an electric trolling motor that is mounted on the bow of a boat. Bow mount trolling motors are designed to be used on boats with flat, raised forward decks. These types of decks are most commonly found on bass boats, which are designed for fishing for large-mouth bass in shallow water around weeds and stumps where precise boat control is necessary. One of their most notable advantages is that they provide significantly better control when compared to a transom mount motor. This is because a bow mount motor pulls the boat through the water, as opposed to pushing it from behind (as a transom mount does), and makes steering much more precise. The fact is putting a trolling motor on the bow does give a decided advantage to control in wind and waves. Simply put, you can’t push a rope but you can drag it all day long. Bow mount trolling motors are more suited to use of a new feature in GPS-based trolling motors – the ability of the motor to hold the boat in position. This is because when the boat is being held from the bow, the boat aligns bow-first into the wind and remains quieter. Bass fishermen who spend their day moving constantly, casting from the bow, prefer bow-mounted to transom trolling motors as they can take the advantage of a foot pedal to drive the boat while fighting fish. 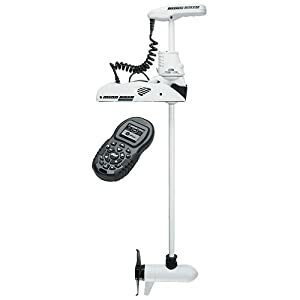 Many Minn Kota’s bow mount trolling motors come with a foot pedal when you purchase from Amazon or other retailers. How to choose the Best Bow Mount Trolling Motor? One of the most important factors to consider when selecting the best bow mount trolling motor is determining how much thrust you will need. Thrust, measured in pounds (lbs) is the standard measure of how powerful a motor is. The larger and heavier your boat, the more thrust you’ll need to achieve satisfactory results on the water. How to choose the best trolling motor battery? A stronger trolling motor is almost always better. It provides more juice to your boat and accordingly more run time. But we recommend you reference the following table to select the motor size that best suits your needs. Note: Take conditions such as wind and current into account and increase thrust. If the boat is also closer to 2,500 than 2,000 use larger. Choosing the correct shaft length is important so that the angler’s electric motor does not cavitate, creating fish-spooking noise. As a rule of thumb, the center of the motor section should be submerged 12 inches. For bow mount trolling motors, you need to measure the distance from the top of your bow to the waterline. After determining the mount-to-water distance, add 5 inches to your measurement for fishing in rough water. Adding 12 inches to your measurement for steering a hand control motor while standing. Below is the recommendation of Minn Kota to help you find the appropriate shaft length for optimal performance. The Maximum Minn Kota trolling motors are a step up from the Minn Kota Edge as they offer larger thrust levels, a beefy spring-protected shaft housing, an illuminated directional indicator, and select models offer a variable speed motor. This Minn Kota Maxxum 70 Bow-Mount Trolling Motor is one of the best bow mount trolling motors on the market which is designed for medium to large freshwater v-hull, bass, pontoon and general fishing boats up to 23 feet. 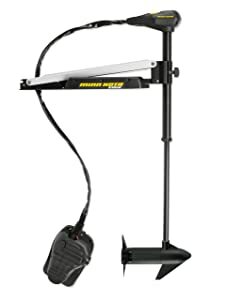 This trolling motor features a super heavy-duty aluminum mono arm, illuminated directional indicator, removable BowGuard 360 mount, a Push-to-Test battery meter, and the integrated digital maximizer technology. The digital maximizer technology provides up to five times longer run time on a single battery charge by drawing only as much power as you need. And the Bowguard 360° breaks away on impact from any direction and automatically resets itself – protecting your motor and your boat, so you can fish without worry. The Haswing Cayman B 12v 55lbs Bow Mount Trolling Motor comes with a very competitive price, making it well worth considering if you’re looking for an inexpensive bow mount trolling motor. This motor is much cheaper than Minn Kota’s models of the same thrust, so it’s absolutely not a potential rival. But many owners after a long time using this bow mount trolling motor gave it a positive review. This 12V trolling motor is designed for small boats including inflatables and kayaks. It features an extruded upper arm made from marine-grade anodized aluminum that is built for years of trouble-free use. It also has a redesigned motor head that is constructed of highly impact-resistant, hybrid composite material for unmatched durability. The head also integrates a high-visibility directional indicator. And the ultra-responsive foot pedal is ergonomically designed for precise speed and steering control. The Minn Kota Edge 45 bow mount trolling motor provides five forward speed settings & three reverse speed settings to easily choose the speed you need for simple, an intuitive control that puts you in command. With five speed setting, you can choose the speed you need with ease. This trolling motor also utilizes a Latch & Door mounting system for easy removal of the motor for security and storage. And with many great features that you will see on the website of the manufacturer, we’re confident to tell you that the Minn Kota Edge 45 is one of the best bow mount trolling motor for small boats on the market. Nothing better than the Minn Kota Riptide Ulterra Series when your fishing boat is on the sea water. These are the flagship motors from Minn Kota and are some of the most advanced bow mount trolling motors for saltwater currently available. Only the Riptide Ulterra line offers Minn Kota’s revolutionary new Auto Stow/Deploy and Power Trim technology. Additionally, the Riptide Ulterra comes standard with i-Pilot and is available in 80 or 112 lbs thrust. Auto Stow and Deploy makes getting the motor in and out of the water effortless – all you have to do is push a button. Power Trim Technology lets you easily adjust the motor for changing depths. Digital Maximizer technology controls the power draw on the battery at various speeds, eliminating wasted power and extending battery life. The feature that makes Minn Kota Riptide Ulterra one of the best saltwater bow-mount trolling motors is its i-Pilot Link, which lets your Humminbird and trolling motor communicate, so you can control your boat automatically from either the Humminbird or Link’s touchscreen remote. Lock onto spots with the most accurate GPS anchor ever; follow depth contours automatically; store, retrace and return to your favorite waypoints and paths; and more. It’s a fully-integrated system that’s dead-set on helping you catch more fish. 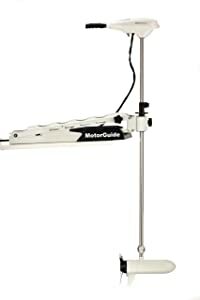 When it comes to choosing the best saltwater trolling motor, the Motorguide Great White trolling motors are the only potential competitor to the Minn Kota trolling motors. They are the choice of guides, competitive anglers, and die-hards around the world. From the specially formulated coating, to the epoxy-sealed lower unit, to the stainless steel shaft – the durability starts on the outside and goes all the way to the core. 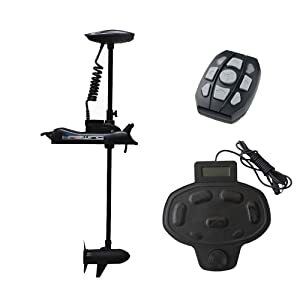 The key advantage of a Motorguide Great White trolling motor is its Digital Guardian, which is designed to monitor your motor’s amp draw, heat dissipation, output and other vital parameters. The result is a motor that self-regulates – a cooler, more durable running motor with an extended service life. It is a self-contained, sealed module in the lower unit that brings all vital motor components together in one protected location, eliminating outdated analog circuit boards and related componentry. The Great White Edition offers you two options in 82 and 105 pounds of thrust with 24V or 36V.